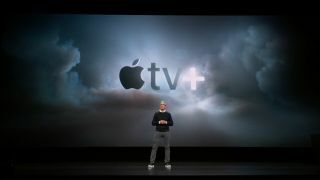 At its special March event, Apple announced Apple TV Plus, a brand new streaming service that, according to its CEO Tim Cook, "is unlike anything that's come before". According to early reports, the streaming service will offer exclusive shows, movies and documentaries from acclaimed filmmakers, including JJ Abrams, Steven Spielberg and M. Night Shyamalan. It's also been announced that Oprah and Prince Harry will also be teaming up for a mental health docu-series, which will come to Apple TV Plus in 2020. In a statement posted to Instagram, Prince Harry said "our hope is that this series will be positive, enlightening and inclusive - sharing global stories of unparalleled human spirit fighting back from the darkest places, and the opportunity for us to understand ourselves and those around us better." The service will include shows like Amazing Stories and The Morning Show, and stars like Reese Witherspoon, Steve Carell and Jason Momoa are signed up to be involved. There's even a show for the preschool crowd called Helpsters. Unlike the basic package of Hulu, Apple TV Plus will be ad-free from the start, and will be available in 100-plus countries through a section of the Apple TV app. It will be available starting in autumn 2019 (September through November) on smart TVs, MacOS and iOS. What is it? A rival streaming service that Apple will place its own content on, among other titles. How much will it cost? That's still, irritatingly, to be confirmed. Apple TV Channels will be incorporated into the Apple TV app on iOS starting in May, and on MacOS later in the year, but will sit outside Apple TV Plus' purview. So Apple TV Plus is like Netflix? This is where things get a little confusing. While on stage, Tim Cook mage it very clear that Apple TV Plus isn't like Netflix – at least not yet. While the service will offer original content by the boatload, Apple TV Plus won't offer licensed content like Netflix or Amazon Prime does, which covers all syndicated shows, like The Big Bang Theory, Mr. Robot or Seinfeld. For now, you'll still have to buy those shows through iTunes or via your terrestrial cable app in Apple TV Channels and turn to Apple Plus for its library of originals. There's also the question of availability. Cook named a number of major TV manufacturers who will offer the new Apple TV app in his keynote, but never came close to mentioning all the platforms where Netflix is available, like Android TV, PC desktops and laptops, and non-Apple tablets. It's also worth mentioning that Apple Plus has been compared to Disney's upcoming streaming service, Disney+. But it looks like even though they might compete in the streaming space, Disney+ will still be available via Apple TV. That's another mystery, as Tim Cook ended the keynote without divulging how much Apple TV Plus will set you back every month. The chances are very good, however, that the service will cost something – as talent on this scale doesn't come cheap. The silver lining to Apple creating its own content, though, is that the service could be relatively cheap – only a few dollars / pounds per month. As we know from Netflix, licensing syndicated content isn't cheap, and those contracts eventually end and must either be renewed or dropped altogether. 11:46 - Oprah is off, Tim is back. Looks like we're wrapping up, which is great for my fingers. This is been a long one and I've needed the toilet for a long, long time. And yep - that's it. He's done. And with no hands on reviews to be done with the services, this seems like a much easier ride for your favorite TechRadar folk. Except for the fact we'll now be noodling away at the big news, features and analysis on what's just been announced. Apart from that. 11:43 - She's making one of the biggest book clubs on the planet, Oprah and the author streamed to every device and Apple Store. To connect everyone with books, is Oprah's dream. 11.41 - Oprah has joined forces with Apple - to create meaningful ways to initiate positive change. She has two documentaries in the works - Toxic Labor (talking about the scourge and toll of sexual harassment in the workplace), and an unnamed one that focuses on mental health and how scenarios that cause problems decimate life. She wants to replace stigma with compassion and honesty... lofty goals there. 11.39 - Oprah just came on stage (possibly) clutching vouchers for cars. iPrah in the offing? She's talking about the way we all crave connections. How we want to be heard but also need to listen. If she announces the Airpower mat I'll be impressed. 11:37 - There's no word on pricing yet - that's a real shame. It's a huge part - but Tim says 'this is just a sneak peek' as he wanders back on stage. Wait, there's one more 'remarkable story teller'. 11:36 - Apple TV+ will come across all your Apple devices and smart TVs. It's an ad-free subscription service, on demand and coming this Fall with new additions every month, focusing on Apple Originals. The message, again, is about quality. When will it be coming, and how much though? 11:29 - Sara Bareilles and JJ Abrams are on stage, talking about their new project: Little Voice, a romantic comedy about what's 'wonderful and transformative' about someone having to find their way through their voice. Sara is having a sing of theme tune for us now. It's a nice time to try and rest the fingers and tidy up this blog... no, she's just finished! SING MORE DO AN ENCORE PLEASE PLEASE PLEASE. 11.26 - I'm watching Sesame Street for work. I never knew this day would come, but suddenly it's here. There's a new pre-school show called Helpsters, with a little muppet called Cody. And it's about coding! This is related to Apple's Swift Playgrounds, you just watch. 11.25 - There's a lot about worthy storytelling here. Apple has been making a big, big push about quality elements today, that there's some gravitas to everything that it's doing. AS I WRITE THAT BIG BIRD COMES ON STAGE. Thanks Apple. 11.24 - He's going to be pushing a program called Little America, with small stories from immigrants - and the directors are either immigrants or children of immigrants. 'We hope Little America will help people to understand there is no other, there is only us'. 11:20 - Kumail Nanjiani is on stage, the actor from Silicon Valley. He's just chatting about his life now, making some jokes. This is a very different Apple event, to be honest. 11.16 - Jason Momoa and Alfre Woodard are on stage to talk up the new programming where the world is blind after a virus wipes out sight and most of the human race, in 'See', a new show coming to Apple TV+. 11:15 - This trio will be the main characters in the show - the characters with which the issues are lensed. 'Shining a light on the fault lines in our society'. 11:14 - Jennifer Aniston and Reese Witherspoon are now on stage - they're doing 'The Morning Show' on Apple TV as well. An insiders view into the lives of the morning newscaster. An 'honest look' at the complex relationship between women and men. Steve Carrell just wandered late on stage. He's making jokes about not knowing whether it's his turn. 11.11 - The video is over, the audience has gone crazy to Steven Spielberg to come on stage. He likes Apple, apparently. He's, once again, talking up how important storytelling is. Spielberg is going to be resurrecting 'Amazing Stories' for Apple TV. 11:08 - The video is still going on, the normal Apple 'enchanting' video, where the world of creativity, the wonder it presents, makes the viewer want to be part of it. To want to be involved in the Apple world. 11:07 - Actors are talking about how they 'imagine' what the character would be thinking when they embody them. Thanks for that. 11:04 - The power of stories is important. 'Here at Apple we know incredible stories begin and end with the artists that create them'. We're going to meet some of them. This service is dedicated to 'the best stories ever told'. This sounds interesting... the 'art of great storytelling'. 11.03 - And here's the big news: Apple TV+. Everyone has lost their minds suddenly here.